In preparation for their November 20th release of the concert film R40 Live, iconic Canadian rock trio RUSH have shared another video clip from the film, this one for the seminal track "Spirit Of Radio". You can check out this great live clip on KNAC.COM right HERE. All roads have led to this. Forty-one years in the making, the R40 Live tour took a very real journey back through time. Beginning with the grand design: a state-of-the-art stage set that pivots, rolls and dives, and brings Clockwork Angels in to bombastic, colorful life before marching stridently back in time (through theatre stages, a panoply of band and fan shots, the accrued memories of a life spent playing live) to a mocked-up school gym and the band playing there; a solitary bass amp set on the chair behind , a mirror ball spiraling crazily above, casting thin rods of light like a light rain across the crowd, “Working Man” coming to a shuddering halt as the band’s beginning becomes their end. 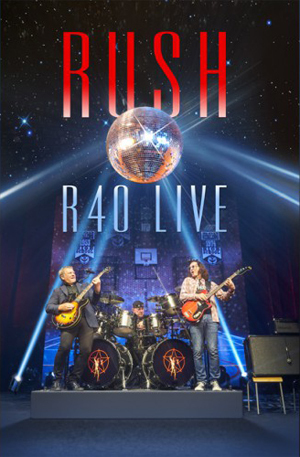 RUSH recorded and filmed R40 Live over two sold-out shows in the band’s hometown of Toronto at the Air Canada Centre on June 17th & 19th, 2015 in the middle of their R40 Live 35-date North American tour. R40 Live had the trio of Geddy Lee, Alex Lifeson and Neil Peart, performing a career-spanning live retrospective, celebrating their 40+ years together. The epic live shows by the Rock Hall of Famers were captured with 14 cameras to present the band feature-film style. You can order this must-have film in various formats right HERE.